Ready, aimed and focused power-punk trio, JuiceheaD, fronted by singer/songwriter Rob Vannice (Guitar & Vocals), had already taken their hometown of Chicago by storm before launching worldwide on Misfits Records. Taking their punk rock assault to the masses, their impressive 16-track DIY debut, “The Devil Made Me Do It”, came packed with face-ripping guitar muscle, sing-along hooks and a sonic rhythm section that demolishes buildings in its wake! Armed with a hard, aggressive melodic arsenal and thought provoking lyrics, JuiceheaD defines the new breed of American punk rock. Their music is infectious, contagious and packs enough punch to satisfy most old school punk rock fans, while simultaneously delivering a universal sound that any enlightened music fan will truly appreciate. Formed in late 2003, JuiceheaD forged from the ashes of several local punk bands and fused a unique union of skilled playing and solid song writing. Rob Vannice had been active in the Chicago underground since 2000 in various bands, but found a secret weapon in Tommy Kloss, a classically trained guitarist turned bass player with who he had been honing the JuiceheaD sound. With the addition of Zac Dawson on drums, the three-piece catapulted into ear bleeding abandon and reached the next level. 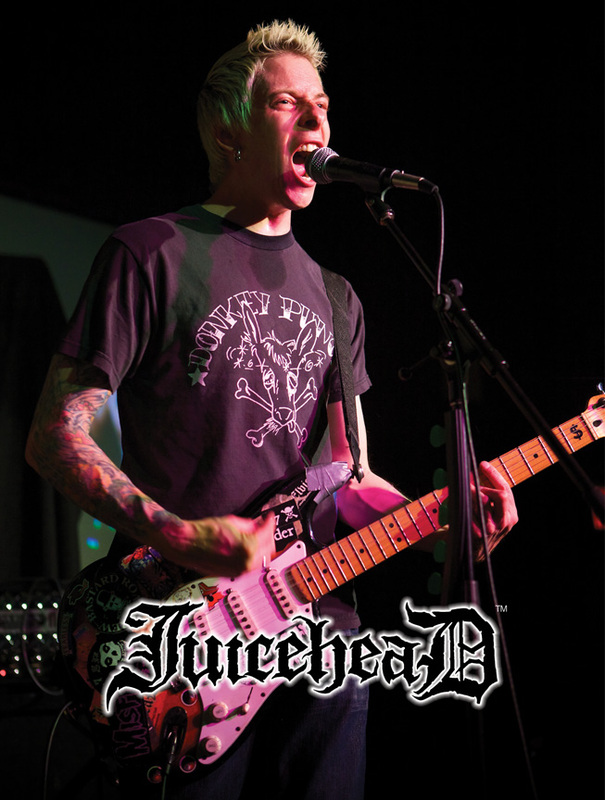 JuiceheaD has since toured across North America including the Misfits Records’ Fiend Fest tour, several regional and national treks with surf-punk pioneers Agent Orange, nationwide touring with UK punk staples the Adicts, and multiple nationwide tours as primary support for the legendary Misfits. Two songs from JuiceheaD’s all-new, full-length, breakthrough studio album “How to Sail a Sinking Ship” have been chumming the water via a Ltd Ed. vinyl 7-inch single with free Digital Download card. The single, now in its (nearly sold out), 2nd pressing, showcases the band’s ability to combine a diverse range of musical styles & influences into their own blistering blend of punk rock—as does the entire album. JuiceheaD encouraged music fans to support local indie record shops by offering the first pressing of the single in an ultra-limited, Record Store Day exclusive 7-inch vinyl color-way, which quickly sold out. The first track from the single, “Rotting from the Inside”, debuted at #40 and eventually climbed to #33 on the Alternative Specialty Radio Charts with consistent spins on both college and commercial radio nationwide. Track two, “Death of Democracy” also surfaced on air nationwide and continues to spin in heavy rotation on Sirius XM’s Faction channel on a daily basis. “How to Sail a Sinking Ship” is produced by longtime Misfits & Ramones collaborator John Cafiero. Known for chart topping releases, Producer/Osaka Popstar frontman Cafiero also appears on guest backing vocals for “Rotting from the Inside”. Additional guest appearances on “How to Sail a Sinking Ship” include Melora Creager (Nirvana, Rasputina) on cello for the punk-goth ballad “Black Roses”, and The Punk Pipers (consisting of NYC Firefighters) adding a traditional bagpipe flavor to the melodic track “When I Fall From Grace”. The cover and interior art showcases illustrations by Joe King (Crooks N Castles, Billabong, and Obey Giant). Iconic artist Shepard Fairy personally recommended King for the project to Cafiero. JuiceheaD has authentic old school punk sensibilities with a crossover appeal reminiscent of forefathers like The Clash. Recorded at Bennett Studios (owned and operated by the legendary crooner and his family), nearly every song on the album has hit single potential—without compromise—as does the band itself to grow into becoming the next Green Day, Rancid or Social Distortion for a new generation. JuiceheaD’s “How to Sail a Sinking Ship” featuring 20 tracks with over an hour of new-music, casts off on October 4th, along with a nationwide tour of North America as direct support for the legendary Misfits through Dec. 2011.